Known as the Link Trail until early 2007, the Standing Stone Trail (SST) connects the Mid State and Tuscarora Trails and traverses the Blue Mountain and Seven Mountains Regions. The 76-mile trail is orange-blazed and maintained by Standing Stone Trail Club. The new name derives from a tradition among the Native Americans of what is now south-central Pennsylvania to maintain tribal genealogies on a “standing stone” displayed in each village, inspiring early settlers to use the term as a general name for the region. In 2007, the former Link Trail Club changed the name of the club and the trail to the more historically poetic Standing Stone. The northern end of the SST is at Greenwood Furnace State Park, where it meets Greenwood Spur, a side trail of the Mid State Trail System that leads 6.7 miles north to the MST. The southern end of the SST is near Cowans Gap State Park, where it meets the Tuscarora Trail. 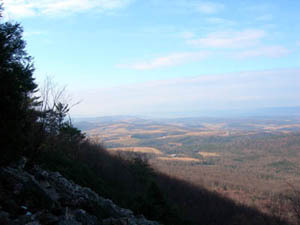 The long-distance hiker can travel from the Mid State Trail in Centre County to the Appalachian Trail in northern Virginia by using the Greenwood Spur, the SST, and the Tuscarora Trail. From its northern trailhead, the SST follows the top of Stone Mountain south. After crossing PA 655, it climbs over Jacks Mountain, descending on the famous Thousand Steps Trail and crossing US 22 and the Juniata River at Mapleton. The trail continues south, passing Jacks Mountain Fire Tower and continuing to Three Springs. South of Meadow Gap, there are private land issues at the time of this writing, so you must use a blue-blazed side trail to reach US 522. South of US 522, the SST tunnels under the Pennsylvania Turnpike to reach Buchanan State Forest, where it joins the Tuscarora Trail. ​To download digital maps, visit the club’s website.